Indiana ranks seventh in the Small Business & Entrepreneurship Council’s 2017 Small Business Policy Index (up from 10th in last year’s ranking). 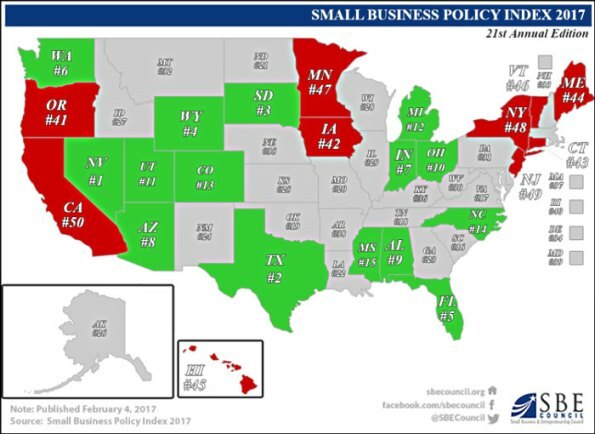 This is the SBE Council’s 21st annual look at how public policies in the 50 states affect entrepreneurship, small businesses and the economy. The report ranks the 50 states according to 55 different policy measures, including a tax, regulatory and government spending measurements. According to the report, the most entrepreneur-friendly states under the “Small Business Policy Index 2017” are Nevada, Texas, South Dakota, Wyoming, Florida, Washington, Indiana, Arizona, Alabama, and Ohio. In contrast, the policy environments that rank at the bottom include Rhode Island, Oregon, Iowa, Connecticut, Maine, Hawaii, Vermont, Minnesota, New York, New Jersey, and California. This entry was posted in Business News, Energy, Government, Tax/Finance and tagged indiana, policy index, ranking, sbe council, small business, taxes by Indiana Chamber of Commerce. Bookmark the permalink. As a small business owner who has owned businesses in several different states, I can personally attest that Indiana is a very business friendly environment that promotes small business. Small business is the backbone of our economy and we need to do everything we can to support them.